I was just doing ancestry research and found that William Bill Ory drove at Millburg during the 1950's. He is my first cousin. Found a lot of info on his race driving days in The News-Palladium site in newspapers. com This lists a lot of other drivers also. If anyone knows anything about him please leave info here. My dad used to race motorcycles there in the early 70's. He was friends with the Ken Scheffler and their family. What a fun bunch of people great memories. My Dad's name is Ed Wolph. 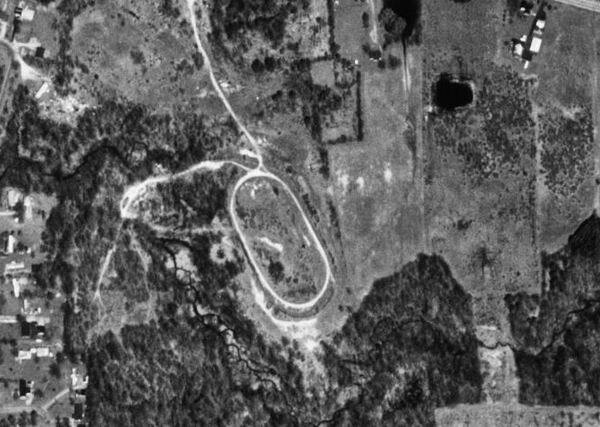 My Dad used to race at Millburg in the 50's. Anyone out there remember Bob Gerren? Used to use Ben Gay as his racing name. By the way, I was told he never lost an Austrailian Persuit. 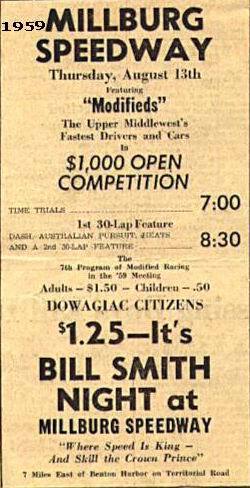 Friday and Saturday nights during the late 50's and early 60's would find myself and Billy Becker at the track. It was a grand experience, the speed, the noise and the fumes from the track intermingled with the smell of oil and gasoline and hot dogs. My favorite driver during those years was Les Williams who drove M-1, I believe a Pontiac straight eight. Sorry to say Iseldom paid to enter but snuck in under the fence. Although caught several times, Paul was always understanding and would admonish us, knowing we would be back. I really missed those races when they closed down. Bigger and more powerful cars, and larger and faster tracks were not easy on a 1/4 mile track. We stopped by the old Millburg racetrack today and could see that it is being worked on. Anyone have any information on this? Is it going to open up again? We had a lot of great times racing there back in the 70's. Gary, Australian Pursuit is when they line up all the cars in a single file and they start the race. When a car gets passed, that car has to drop out of the race. Most race tracks had one Australian Pursuit race a night. They grew out of popularity for reasons unknown. What is an Australian Pursuit?. My great grandfather was the one who founded and built the millburg speedway. His name was Paul Scheffler. My grandfather Ken and uncle Jerry helped him run the speedway. After Paul was killed building the dc cook nuclear plant the speedway fell apart. Grandma Dora tried to keep it running but got too old. This was reopened for a while in late 70s or early 80s but has been closed since.